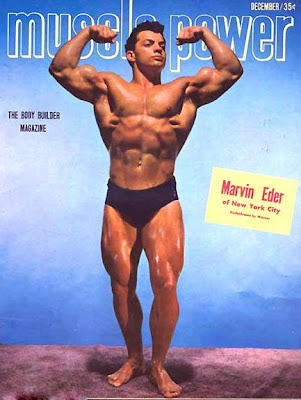 Marvin Eder was the strongest man pound for pound during his time. Maybe forever. 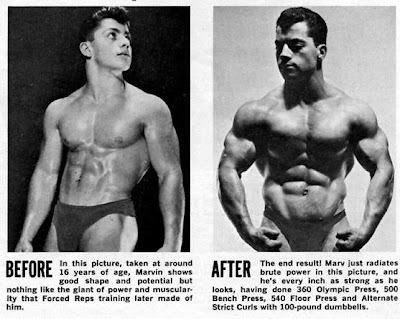 He existed in the time slightly before the popularity of “exotic supplements” His lifting feats were impressive. Olympic press 335 lbs when the American record was 281, and the World 316. Clean and Press 120 lb. dumbells for 10 reps.
Press behind neck – 305 lbs. Side press, left hand – 220 lbs. Dips on the parallel bars with 434 lbs , 7 reps with 400. Bench press 515 lbs. Only man to bench 500 under 200 lbs in the 50’s. Stiff arm pullovers – 250 lbs. 100 “wide arm” chins – 8 reps with 200 lbs. Single with 250 lbs. Strict curled 210 lbs , cheat curl 255 lbs. Deadlift, without practice 665 lbs. Day 1 – five sets of 10 reps dumbbell laterals using 120lb dumbbells (unlocked elbows), 5 x 10 seated dumbbell curls same 120lb dumbbells. Ditto bench presses and triceps curls (5 x 10 120lb dumbbells) followed by lat machine pulldowns 5 x 10 x 350 lbs.